One day a long time ago, I saw the Guadalupe River filled with water, and wondered if anyone ever tried to kayak in there. 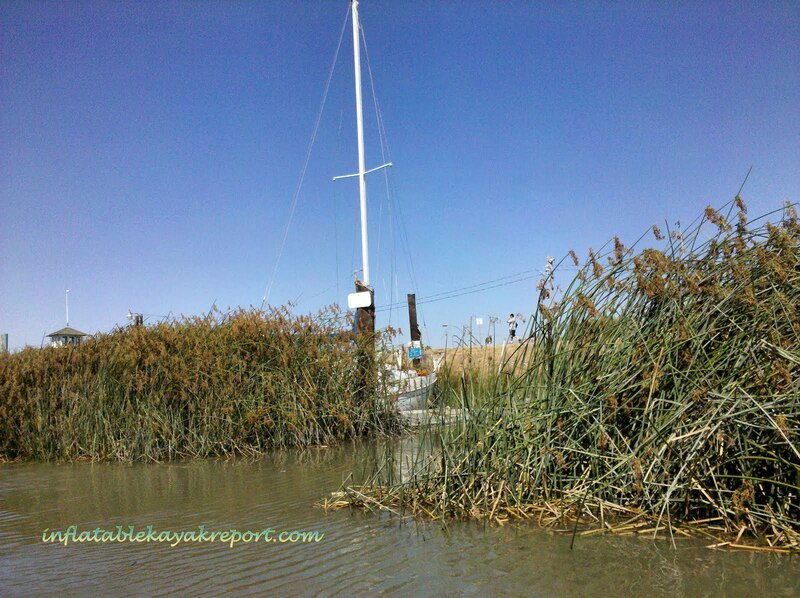 That was before the Alviso marina boat ramp was built and getting into the Alviso Slough/Guadalupe River was difficult in high tide and impossible at low tide. Everything changed with the new Alviso boat ramp. Now getting into the water at any time is a breeze. Most boat traffic head northwest, toward the bay. On this trip, my friend Dave and I, with our sons, went southeast, going further inland. The Gudalupe River is a raging, flooding, dangerous river in the wet winter season. However, in the dry summer months, it is entirely tidal with little fresh water coming down the river. To go as far inland as possible, I chose a day when the tide was the highest of the month. On this day, it was +10.78 feet at 3:30 PM. 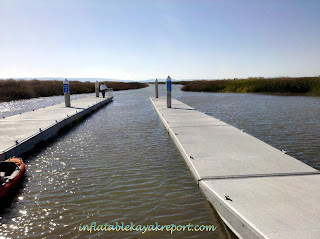 The newly built Alviso boat ramp had more than enough parking spaces for the biggest event. Putting in was easy and the dock was one of the cleanest and best looking I've seen. Turning left, we were immediately greeted by the South Bay Yacht Club, and passing it, a few abandoned boats. As we paddled onward, the waterway started to get narrower. After the first bend, we reached the railway bridge. It just so happened that a train was passing by up ahead and I was lucky enough to capture it. After the railroad bridge, it was the Gold Street bridge. You can see it in the background. Around here, there must had been a thousand little black birds. As we passed by, they all flew up and circled around. It felt like we were in an Alfred Hitchcock movie! Dave took this video of my son and I paddling leisurely along the Guadalupe River. Now it really started to feel like an adventure. Most of this part of the Guadalupe River was still pretty open, but there were areas where it got tight enough that two kayaks could not pass through at the same time. 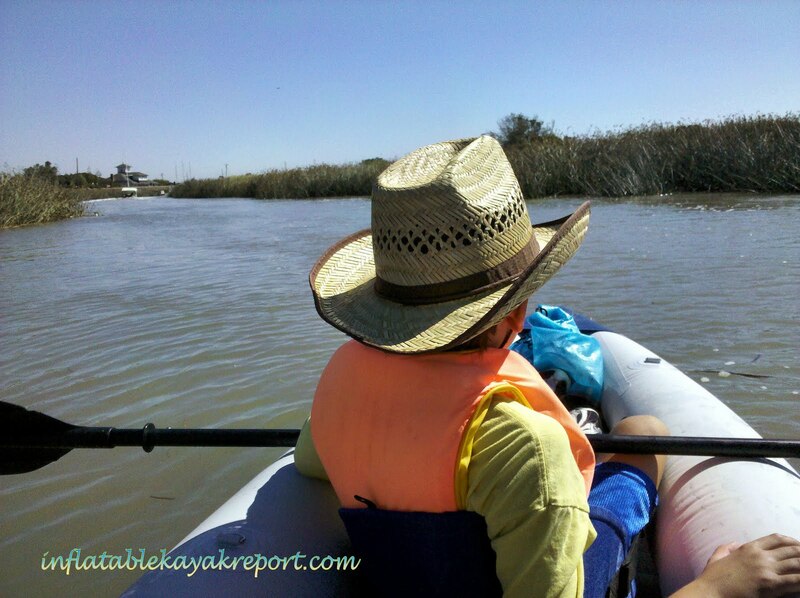 Once in a while, my paddle would flick up a piece of floating weed to have it land in the boat. Like I said, feeling like a real adventure! It was around here that I felt the current really carrying us along. It was already about 3:30 PM, high tide according to my favorite tide chart: Mobile Geographics. The water should be slack right about now since it was exactly the high tide point. However, the water was still rushing in. 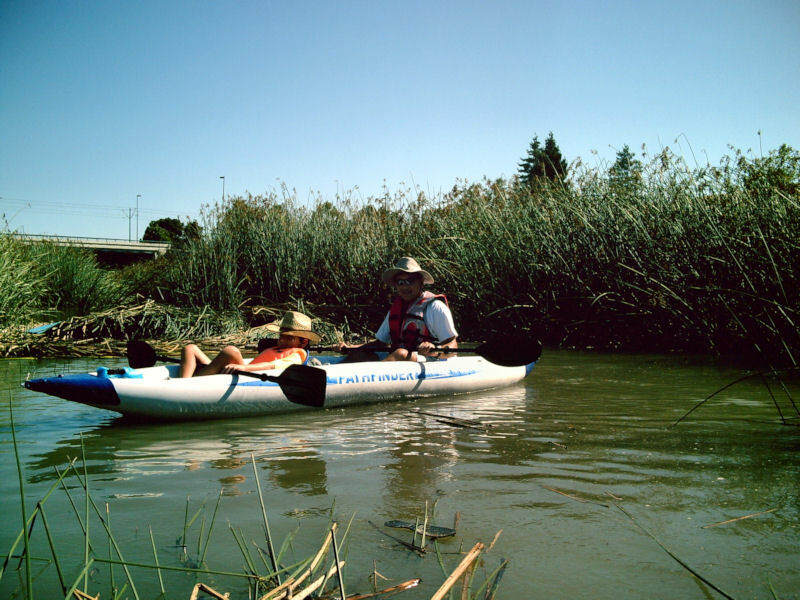 From another San Francisco Bay paddle, I learned that slack water in the bay is generally 1-1/2 to 2 hours following high or low tide, because it took that long to fill or drain the bay. 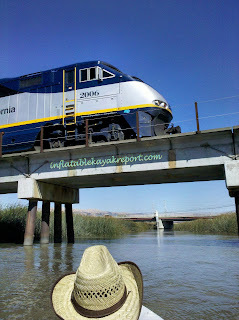 However, in a small tidal river like the Guadalupe River, I didn't expect the lag to be much of anything. As you will see later, we learned something that day! We reached the end. A 15 feet long floating debris field blocked the way toward Tasman bridge. There was still plenty of water depth. I stuck my entire paddle vertically into the water and couldn't reach the bottom. There was still plenty of elbow room, although it had gotten quite narrow. We could have pushed our way through, but this being our first time, we decided to turn around. Here is a picture of my son and I, having gone as far as inland on the Guadalupe River as any boat had gone. Final destination, a few hundred feet short of Tasman bridge; you can see Tasman bridge in the background. 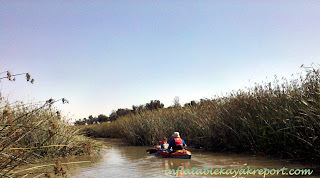 As we turned around, we immediately felt the pressure of the inward rushing water and the wind. It was a challenge paddling back out - the progress was much slower than the way in. In turned out that even after 1/2 hour past high tide, water was still coming in (flooding). I believe that the narrowness of this section of the Guadalupe River caused the water to take some time to fully flow in or out of waterway, thus the lag in the current switch after high or low tide. Anyway, the current and the wind made the return trip difficult. The lesson learned - do this in the morning if possible to avoid the wind. Another note is that there really weren't any places to get out of the the kayaks, say for a picnic or something, so plan on going in and come directly back out. In all, the trip was a success. We were able to explore a two mile stretch of the Guadalupe River that hasn't been documented before and the trip felt like an adventure. It came complete with some excitement, amazement, some fear and soreness - a good day.